Catching right now at the power plant isn’t blockbuster for sure. It is however not horrible! With that said it’s about normal for this time of year according to the last 20 years I’ve recorded it. One thing for sure is you won’t catch a fish if you don’t go and you might not catch one if you do go! 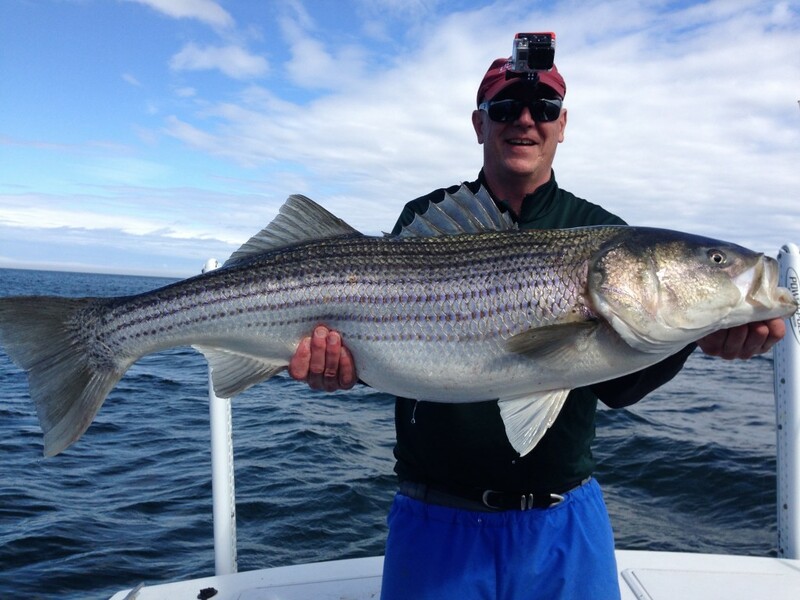 None-the-less it’s fun and it’s a way to have a good shot at catching a Striper in the dead of winter. Big fish can and will happen in the dead of winter, just not consistent or reliable. Some winters we get more large fish in the flow than other years in Jan/Feb. 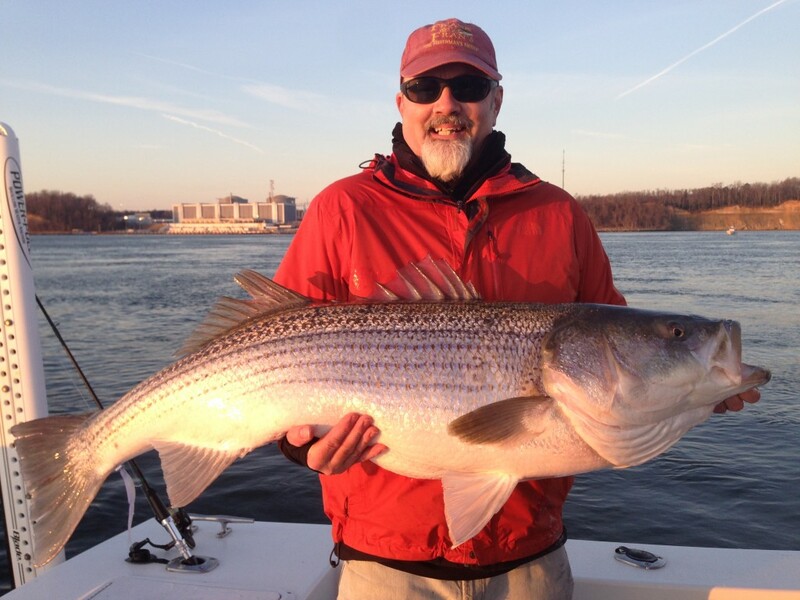 Mid-March usually begins a more reliable and consistent flow of big fish into the outflow. One “first” for this winter is specks in January! A few Speckled Sea Trout have been caught. I hadn’t seen this ever! So……that is pretty cool. You just never know! Also some small Puppy Drum have been caught……Jan 2 the boat I was on caught 4 I think. The Specks and Reds were caught on 6″ BKD’s loaded on 1.5 or 2 ounce heads. Trick with them is certainly maintaining bottom with a sharp short twitch while maintaining a snug line which enables the detection of a strike. 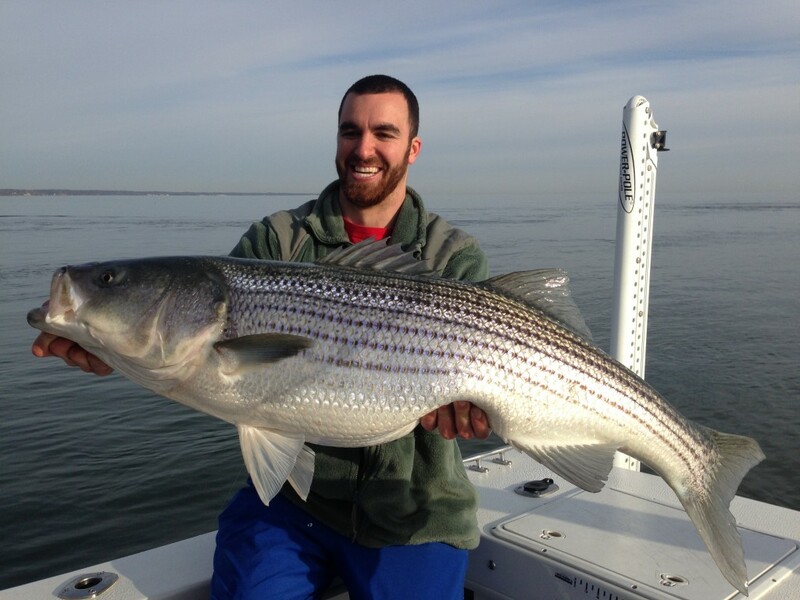 If you get hits and miss several they may be Specks, Reds or very small Stripers. To catch the missed fish downsize your bait and jighead weight if possible. The Specks have been located for me more down the flow just past where the boulders end. The bottom is oyster shell and easy to detect bottom without snagging. Evaluation of the extended temperature forecast indicates about average temps from here to Feb 4. Some above average temps and some below. Bottom line is overall about average. Now we all know that can change! 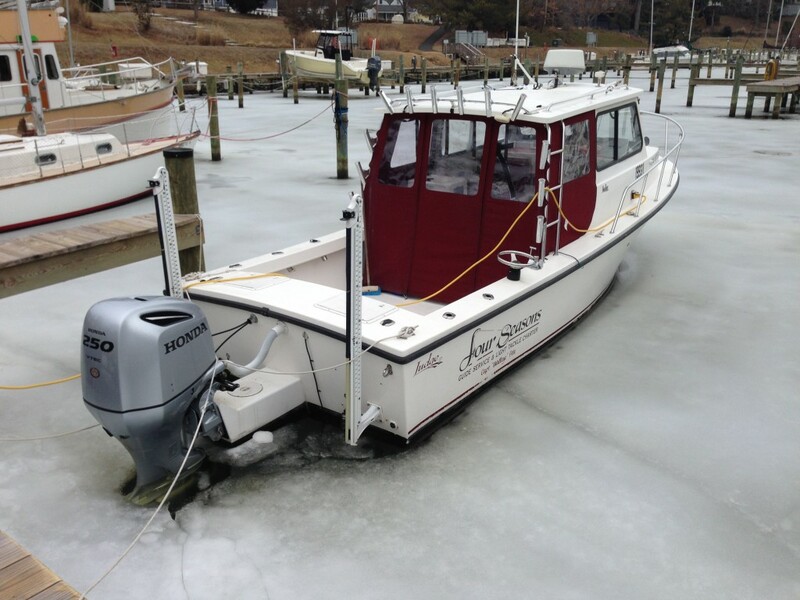 Ice will be a factor on some occasions out of Flag Harbor but probably not from the Solomons boat launch. I don’t have enough experience from Chesapeake Beach or Breezy Point to comment on ice. I expect fishing to maintain an Avg. historical bite this winter from now till Mid March. I don’t expect any blockbuster runs of crazy great fishing but for the persistent guys who just want to get out there and take a shot at some fish I think it will be good! A 4 hour trip with 4 guys who know the game should be able to hit 20 or so fish. A big one right now is 28″-33″……haven’t seen any true big ones yet. Could happen though! Luke with a big March fish! March 10, 2015…….Most ice ever this winter! One thing for sure is winter is dangerous! Water is deadly and fast! 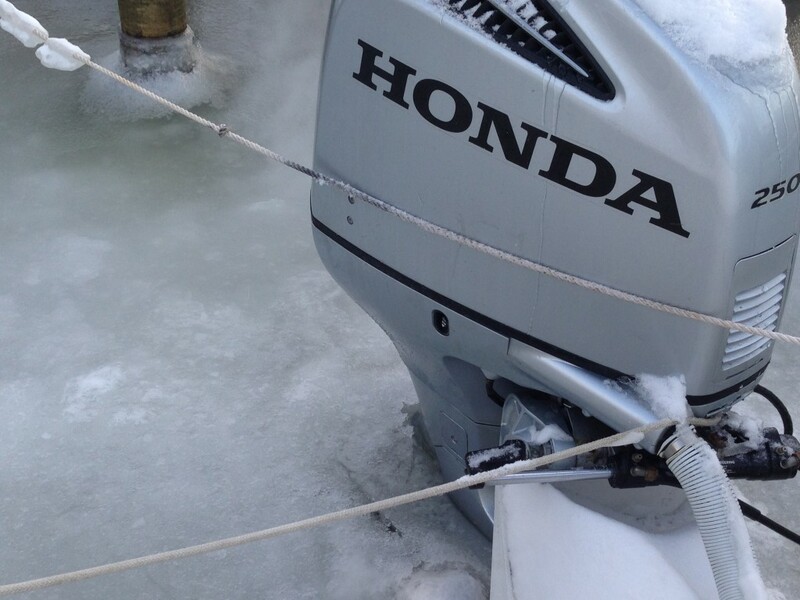 Anyone running their boat in winter needs to take xtra care to make sure you are prepared. I don’t have my boat back yet but when I do it will be readily available and I can get to it very quickly if anybody has a problem out there. I would roll out there quick if anyone called and needed help. We don’t want this in 2017! So…..as of now we do have some fish at the plant. It’s average over the long haul and I hope it gets real good! Nothing would surprise me, either way good or bad can happen any given year. A boring average report and winter outlook. Good luck fishing and STAY SAFE! As of now I don’t have a hard date on when I’m getting my boat back. I’ll find out later this week I hope. If Flag Harbor is iced in I’d go from Solomons. When I do get my boat to Flag Harbor I plan on running 1/2 day trips starting at daylight till 11ish and 1pm till darkish. If you want to book the boat for anything in Jan or Feb give me a call and I’ll throw you in the book, I will take up to 4 for these trips. The boat booked will be 375 for up to 4 anglers until March 15. Walk-On Trips will be $70 each before March 15. When you book the boat you are guarenteed that date for your crew. All walk-on trips will be relatively short notice. I will provide all baits/tackle or bring your own, licensing and HEAT! These trips will be focused on proper technique…having fun and hopefully catching some fish! Prior to our trip we’ll talk about whats going on with the fishing and of course weather and we’ll decide to do or not do the trip. 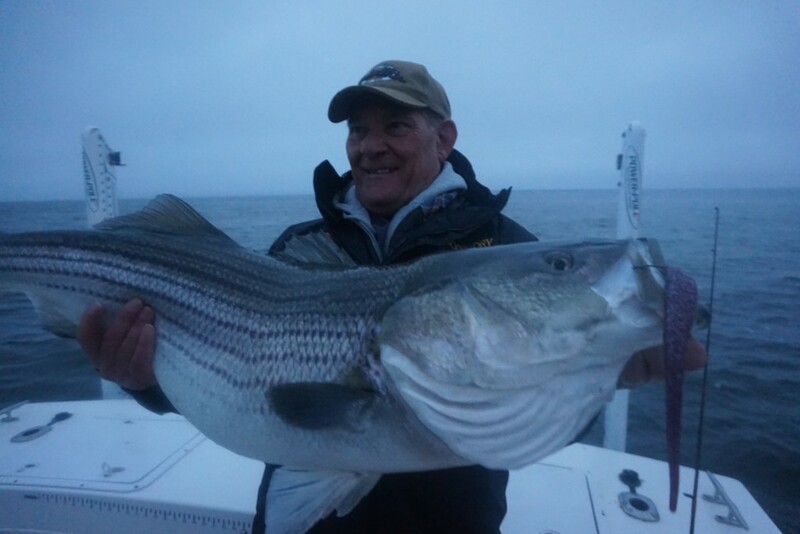 The winter fishery is “iffy” with weather and catching……I’ll tell it like it exactly as I know it. Will this season be NIBF? sure looks like that is true Rich!